action, adventure, articles, cool stuff, cult movie, drama, DVD, entertainment, Family, fantasy, featurette, films, franchise, history, movie clips, movies, nesw & Gossip, news, news & Gossip, PEOPLE, POSTS, previews, sci fi, thriller, trailers, Uncategorized, updates, WTF?! There’s been talk for years now will there be a fourth movie, no one knows but have you ever wished that Jurassic Park Trilogy will be released in glorious Blu-Ray? Your dream is over boys & Girls as Universal Pictures International Home Entertainment have just sent us information/press release that JURASSIC PARK Blu-Ray Trilogy Boxset set is coming to the UK on October 24th! Based on the best selling Michael Crichton directed by Steven Spielberg one of the most anticipated trilogies will finally be enjoyed in glorious high definition Blu-Ray Style. We’re not even half way through Summer and already they’ll be millions of the franchises fans writing up their Christmas presents lists, without any more delay feast your eyes on the information for the boxset below along with the special released trailer! The wait is finally over to experience one of the most anticipated motion-picture trilogies of all time like never before when Jurassic Park, The Lost World: Jurassic Park and Jurassic Park III debut as a trilogy set on Blu-ray™ October 24th 2011 from Universal Pictures International Home Entertainment. Acclaimed filmmaker Steven Spielberg’s award-winning cinematic franchise, based on the best-selling book by Michael Crichton, generated nearly $2 billion combined at the worldwide box office and featured groundbreaking visual effects that changed the art of movie-making forever. Now, all three epic films have been digitally restored and remastered in flawless high definition for the ultimate viewing experience. Additionally, the films’ visceral sound effects and the unforgettable music from legendary composer John Williams can now be heard in pristine 7.1 surround sound. This collectible three-movie set also features hours of bonus features, including an all-new, six-part documentary and digital copies of all three films that can be viewed on an array of portable devices anytime, anywhere. 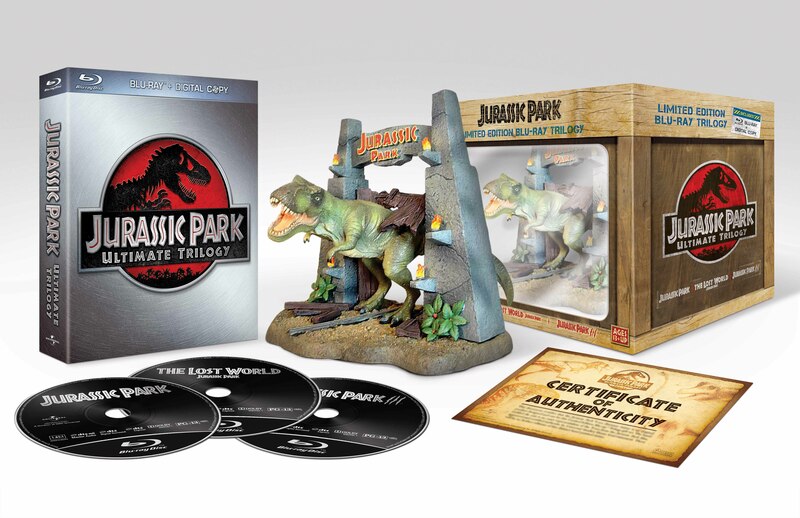 The Jurassic Park Ultimate Trilogy is also available in a spectacular Limited Edition Gift Set, Ultimate Collector’s Gift Set and on DVD. The Jurassic Park Ultimate Trilogy features an all-star cast including Sam Neill, Laura Dern, Jeff Goldblum, Samuel L. Jackson, Richard Attenborough, Ariana Richards, Joseph Mozzello, Julianne Moore, Vince Vaughn, William H. Macy and Tea Leoni. In addition to the talented cast of actors, the Trilogy features stars of a different magnitude—from the huge Tyrannosaurus rex to the vicious Velociraptor, the Jurassic Park films showcase an extraordinary level of realism and technical innovation brought to life by a talented design team which include: Stan Winston, Live Action Dinosaurs; ILM’s Dennis Muren, Full Motion Dinosaurs; Phil Tippett, Dinosaur Supervisor; Michael Lantieri, Special Dinosaur Effects and Special Visual Effects by Industrial Light & Magic. “Return to Jurassic Park” – this six-part documentary features all-new interviews with many of the cast members from all three films, the filmmakers and Steven Spielberg. · BD-LIVE™: Access the BD-Live™ Centre through your Internet-connected player to watch exclusive content, the latest trailers, and more! MY SCENES: Bookmark your favorite scenes from the film. From Academy Award-winning filmmaker Steven Spielberg, the Jurassic Park Ultimate Trilogy is one of the most successful film franchises in worldwide box-office history. On a remote tropical island, an amazing living theme park becomes a game of survival for humans foolhardy enough to set foot on it. Meticulously recreated dinosaurs spring to astonishing life as the film’s breathtaking special effects and thrilling action sequences keep audiences on the edge of their seats. Each chapter of the history-making saga delivers even more action and spectacular visual effects than its predecessor, as nature’s ultimate killing machines once again rule the earth. Almost 20 years after its inception, the Jurassic Park Trilogy remains an unmatched cinematic experience. Jurassic Park: A multimillionaire (Richard Attenborough) unveils a new theme park where visitors can observe dinosaurs cloned using advanced DNA technology. But when an employee tampers with the security system, the dinosaurs escape, forcing the visitors to fight for their survival. Sam Neill, Jeff Goldblum and Laura Dern star in this thrilling, action-packed blockbuster from acclaimed director Steven Spielberg and based on the novel by Michael Crichton. The Lost World: Jurassic Park :Four years after Jurassic Park’s genetically bred dinosaurs ran amok, multimillionaire John Hammond (Richard Attenborough) shocks chaos theorist Ian Malcolm (Jeff Goldblum) by revealing that Hammond has been breeding more beasties at a secret location. Malcolm, his paleontologist ladylove (Julianne Moore) and a wildlife videographer (Vince Vaughn) join an expedition to document the lethal lizards’ natural behavior in this action-packed thriller. Jurassic Park III :In need of funds for research, Dr. Alan Grant (Sam Neill) accepts a large sum of money to accompany Paul and Amanda Kirby (William H. Macy and Tea Leoni) on an aerial tour of the infamous Isla Sorna. It isn’t long before all hell breaks loose and the stranded wayfarers must fight for survival as a host of new — and even more deadly — dinosaurs try to make snacks of them. Laura Dern, Michael Jeter, Alessandro Nivola and Trevor Morgan co-star. Remember 24th October is the big day when this monster of a box set will be released in UK & Ireland, to avoid disappointment pre-order your box set HERE!